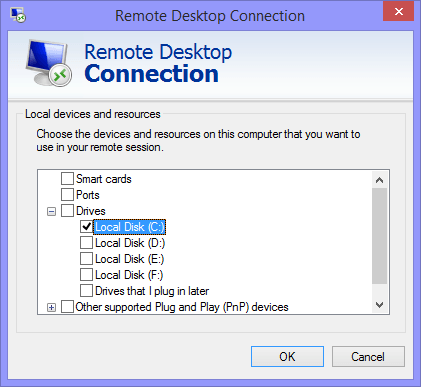 In this guide we will show you how to transfer (copy) files between your computer and your Forex VPS using RDP. 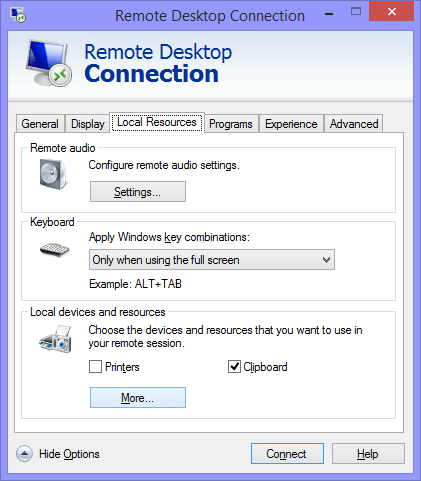 Launch RDP (Remote Desktop Program) and click on [Show Options] (alternatively press left [ALT]+[O] keys). Go to [Local Resources] tab and click on [More...] button under Local devices and resources section. 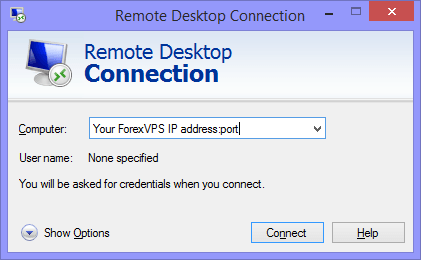 In this window you will find all of the available drives on your computer that can connect to your Forex VPS. Select a drive(s) that you want to share with your Forex VPS. After that click [OK] and [Connect]. Once you have connected, go to [My Computer] on your Forex VPS System, there you should be able find the drive(s) that you have selected and you can start transferring your files. That's all!